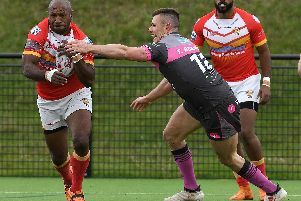 Sheffield Eagles will need at least a dozen new faces next season, and director of rugby Mark Aston doesn’t plan on hanging around in his pursuit of his targets. The Eagles have the final three rounds of their current campaign to negotiate, and they could officially seal their survival this Sunday at Batley. Aston recently confirmed that he has made up his mind about which of his current crop he wants around for 2019, whilst he also has seven members of his squad under contract for next season. With the Eagles chief having a good idea of the budget he’ll be working towards, Aston wants to move quickly in the market after off the field issues forced him into a late recruitment drive over the past two close seasons. Pre-season will be huge for Aston as he looks to mould another brand new team with the 50-year-old stating he wants the majority of his recruitment in place as early as the end of this month. “By the last kick on September 30 we will 99.99 per cent have our squad nailed and done because we need to,” told The Star. “It is going to hot up over the next few weeks. People will be wanting futures sorted, and we have just got to get on with what we have got to do. With the Betfred Championship set to be sufficiently strengthened with the likes of Bradford and York chasing promotion, Aston knows the Eagles are likely to be facing a fight to compete financially with the majority of the division. Whilst recruitment isn’t going to be easy, Aston has operated within much more constrained scenarios in recent years due to instability behind the scenes. Aston has stated on a number of occasions that he would like to instil the dressing room of old back into the club, as he starts the process of improving his side’s fortunes for next season. “We will get the people that we want, but it is not easy,” he added.